Making a poem can be a way to get your mind clear when you’re facing a major crisis. My friend (George) Cameron Keys was the featured poet at one of our Maui Live Poets sessions at the Makawao Library. To help him read his work, he asked another friend, Paul Janes-Brown, a noted actor in our local theater. Cameron said he was afraid that if he read his own work he would start crying. Paul’s reading of this poem got the rest of us in the audience misty-eyed. The beast roared twice before I could give it answer. The voice said I was dying, or that’s what my mind heard. The cure must start NOW, but I have no time. Isn’t it all futile? The voice had said the WORD. Hadn’t I always treated others well, with kindness and compassion? The WORD had made me think otherwise. What had I done? Along life’s path, hadn’t I met many others who were callous? Weren’t they more deserving of this fate? Was anyone? Do I waste my remaining days in this futile attempt? I see despair in Linda’s eyes, fear for us. With too much ahead to live and love. Picking my poison, each creates a new me with the cure. Lose my hair? voice? hearing? job? I chance the worst for music, the best for life. Days are long and lonely, I am now vulnerable, needing invisibility. I hide from friendly eyes. Loving, caring eyes. I hear her crying in my despair, she follows my thoughts with her eyes. Occasionally she rolls over to look at me with a new aspect. Distracting me from other thoughts, allowing me to laugh. A ballet of colour and sound announcing Spring. Taking walks among strangers; laughing and sharing. There is no pity in stranger’s eyes. Don’t they see? I laugh, love, and remain connected to others who have not had the same experience. They need not know of the terrible choices and pains involved. To give caring love, or distance, as each one needs. The story behind the poem is inspirational. Cameron says, “On June 10, 2006 I received the diagnosis that I had Squamous Cell cancer in my neck and throat. As with most people, I thought of the news as a death sentence. The news came by phone as they didn’t want to delay surgery longer than necessary. “I was depressed and thought of what I would need to do to wrap up my life, leaving some security for Linda, my wife. Then I thought that I’ve never been a quitter and I wasn’t going to start now. Getting as much information as I could, my doctors and I developed a plan of action. From then on it was simply making some very hard choices and moving forward. After 2 surgeries, chemo and radiation, I’m still here, relatively healthy, and with a new appreciation and gratitude for life. The poem has since been published in a couple of cancer newsletters. When I decided to start a page on my website for poems of meaning and mana that were written by other folks as well as the stories behind them, I asked Cameron first to allow me to use this poem. 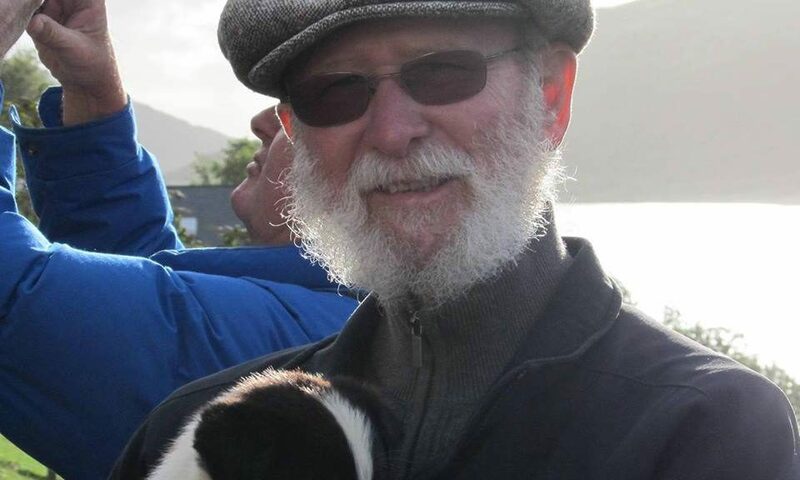 He also graciously provided this recent picture of himself in Ireland cuddling a Scottish Border collie pup.